I did not post Friday’s stats because the market was closed on Monday. 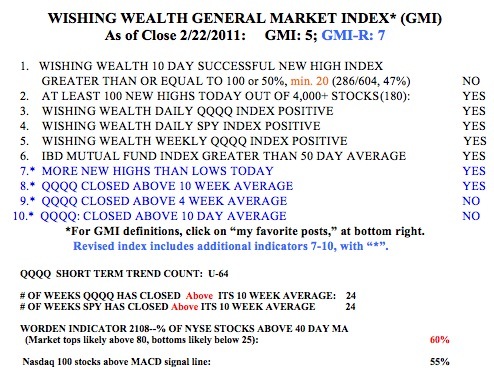 So, today I publish the full General Market Index (GMI) table, that I usually post on Monday morning. The one statistic I want to mention from Friday, was the the Worden T2108 Indicator, which reached 75% on Friday. That means that 75% of the NYSE stocks closed above their 40 day moving average. The T2108 indicator acts like a pendulum of the market. Up-trends tend to end near 80% and down-trends below 20%. With Tuesday’s decline, the T2108 moved down to 60%, in neutral territory. One can get a chart of T2108 by signing onto the the free chart service, freestockcharts.com and entering the symbol, T2108. This service is a good free charting service that can be used for doing technical analysis of stocks, ETF‘s, and mutual funds. The GMI declined on Tuesday to 5, and the more sensitive GMI-R declined to 7. The long and short term market trends I follow are still up, but the short term trend would turn down if the QQQQ does not advance on Wednesday. Last Friday was the 64th day of the current short term QQQQ up-trend. Note that the SPY and QQQQ have closed above their 10 week averages for 24 weeks. This has been a long advance. I tend to become cautious when the market indexes close below their 10 week averages or when the GMI declines to 3 or less. I also become concerned when the market leaders, like GOOG, AAPL, NFLX, weaken, as is now the case. Remember, one can always get out of a position and re-enter it if the stock shows your buy signal. In simulated trading and when trading in a tax deferred account, one does not have to worry about tax consequences or wash sales rules. Bottom line is that I am watching the short term trend of the QQQQ. If it turns down, I will not buy new stocks and will monitor my short term holdings for exits. The key to success in the stock market is to have a lot of little losses and a few very large gains.